Today, I want to provide some sample Army Meritorious Service Medal (MSM) bullet points. If you are recommending someone for a MSM and you are writing the citation for this type of award, you really need to put some thought into it. You need to be detailed, thorough, use real numbers and be specific as possible. I’ve provided 8 sample bullet points for an Army MSM below. Feel free to use these (or modify them) any way you would like to. # 1 During his tenure in Company Command, CPT Edwards maintained a DMOSQ rate of 95% within his company, an improvement or more than 27% since taking command. In addition, he promoted 37 Soldiers, graduated 43 Soldiers from NCOES, and re-enlisted 21 of 23 eligible Soldiers. 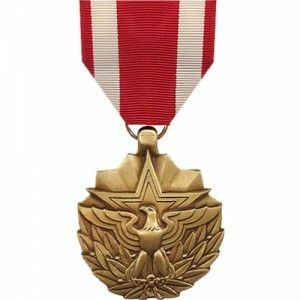 Furthermore, he implemented an effective awards program resulting in 48 Soldiers receiving some type of achievement award. # 2 For exceptional meritorious while serving as the Maintenance Platoon Sergeant. SFC Smith helped the battalion maintain an OR Rate of 98%. He developed new maintenance procedures which resulted in a $300k saving in repair parts. He also re-wrote the Maintenance Shop SOPs and streamlined maintenance operations. His section conducted 1724 man hours of accident free labor. They completed 322 maintenance job and were nominated as the best platoon in the battalion. # 3 While serving as Supply Sergeant with Company F, 234th Engineer Company, SSG James helped his company win the Army Supply of Excellence Award, being chosen over 2,000 other companies. This is a huge achievement considering just before he took the position, the previous Supply Sergeant was relieved and there were huge discrepancies on the property book. # 4 During his two year tenure in Battalion Command, LTC Austin successfully deployed his battalion to Iraq. During the deployment, his battalion completed 2,800 hours of convoy operations without loss or injury. His battalion safely completed 789 convoy missions, delivering mission essential supplies to the forward lines. In addition, he maintained an operational readiness rate of 97% on all 127 of his battalion’s vehicles. The next four MSM bullet points are from my award during my Kosovo deployment. # 5 Prior to the deployment, CPT Holmes spent four months on ADSW at Fort Belvoir as the G4 Plans Officer. During this time, he helped develop the deployment plan and service support annex for the Task Force to deploy from Home Station to camp Atterbury and then Germany. During the training at Camp Atterbury, he had a vital role developing operations orders and participating in the Military Decision Making Process. As a result, the Task Force successfully completed CPX#1, CPX#2, and CPX#3. # 6 During the MRX in Germany, CPT Holmes served as the G4 Plans Officer and assistant Chief of Plans. He had a vital role preparing the service support annex for operations orders, briefing the Commanding General and Chief of Staff and participating in the Military Decision Making Process. As a result, our Task Force had the required Logistics for the MRX and safely deployed from Germany to Kosovo. For his efforts, CPT Holmes was recognized as “Hero of the Battlefield” by the Observer Controllers. # 7 In December, CPT Holmes was appointed as the Supply Support Activity Accountable Officer. As the Accountable Officer, he was personally responsible for an inventory valued in excess of $18.6 million. Because of his leadership, the SSA exceeded nine of nine DA Performance Objectives ans was recognized as the best SSA in USAREUR, by winning the USAREUR Supply of Excellence Award competition. In addition, he saved the Task Force $1.1 million by conducting an ASL Review Board to modify stockage objectives. # 8 In March 2007, CPT Holmes was selected as the Task Force Fuel Officer. His primary responsibilities were forecasting fuel requirements and managing one million gallons of inventory, located in three different countries, valued at $2 million. During the rotation, his section received and issued 1200+ deliveries of fuel, totaling more than nine million gallons, valued in excess of $20 million. As a result, the Task Force had the required fuel to meet all mission requirements. # 9 CPT Tebow’s leadership, guidance, and knowledge resulted in 19 Soldiers getting promoted, 7 Soldiers graduating from NCOES, 17 Soldiers getting certified for the National Guard Reaction Force (NGRF) and 22 of 28 eligible soldiers reenlisting. He also created a mentoring program for his four Lieutenants, resulting in three of his Lieutenants getting promoted to Captain. Furthermore, he supported the “Guardsmen of the Day” initiative, resulting in four new leads and one new enlistment. # 10 The company conducted over 50 convoys, distributed approximately 15,000 gallons of water, prepared and distributed 15,500 meals, issued over 8,000 rounds of ammunition and issued over 14,000 gallons of fuel, all without incident or injury. CPT Tebow also maintained 100% accountability of a $12 million property book and turned in $1.5 million worth of excess equipment. He also arranged to have the entire Mess Section trained at Fort Lee on the Containerized Kitchen Trailer (CKT). # 11 Upon taking command, CPT Tebow’s first mission consisted of moving the company’s entire inventory to a new armory, with a CLRT Inspection less than a month away. The move was flawless and the unit passed the CLRT Inspection. In addition, F Co. supported the Presidential Inauguration in January 2013, providing a 70 Soldier support team. The mission was a huge success. # 12 CPT Tebow’s biggest accomplishment is rebuilding the company and improving morale. When he first took command, the unit was in shambles and morale was at an all time low. He did lots of things to improve the unit such as arrange a company photo, schedule a Family Day and Christmas Party, scheduling team building events, spending time listening to the junior enlisted Soldiers, creating mentoring programs for his officers, and many other “intangible” things. My best advice to you is to write up as good as a first draft as you can, and then to put it down for a few days and then revise it one time. After you do that, have a trusted peer, your boss, or someone from the S1 Shop give it an eyes over to make sure everything is good to go. In conclusion, we’ve covered eight different sample Army MSM bullets. If you are responsible for preparing a MSM, make sure you put some thought into it and use as much quantifiable information as you can. Use numbers, dollar amounts, Soldiers trained, percentages and anything else you can. These type of bullets are much better than generic bullets. What are your thoughts? What are some sample Army Meritorious Service Medal bullets that you can share with us? Leave a comment and let us know. These are great examples of writing short and concise points to get your message across. As Amy mentioned, proper grammar and sentence structure definitely helps it stand out among the others. This is also another example of how important military writing is. I have one question though: When writing a citation for this award how readily available are the numbers and stats? When you are writing awards, you have to find out the numbers and stats yourself by asking the person, or verifying it somewhere else. These are great sample MSM bullets, Chuck. Thanks for sharing. Glad I could help, Marc. Chuck, these are great samples for someone writing a recommendation for a Meritorious Service Medal. Anyone writing a recommendation should be mindful to use proper grammar, to appropriately punctuate all written documentation, to use complete sentences, and to communicate clearly and concisely details about the qualifying event or actions of the soldier involved. It is important to include when and how the soldier's actions were of notable benefit, above and beyond the call of duty given on a daily basis. Using proper grammar is vital, Amy. I’ve seen many MSMs go across my desk that look like a 2nd grader wrote it. That is terrible that anyone who is writing such an important item would not take the time to make sure grammar and punctuation are correct. There are many ways to do so in today’s world, and they are free. While mistakes do happen, the writer needs to proofread and make sure that the item they are writing to get a soldier an award should be as error free as possible.